Third-person shooters have never been as big as their sibling, first-person shooters, but they nonetheless have posted up some impressive results in terms of gameplay, Future Cop: LAPD being a great of late 1990s cooperative gameplay on the PlayStation. 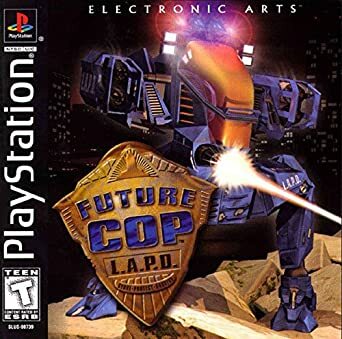 Developed by EA Redwood Shores, the same outfit behind games like Road Rash and Dead Space 2 and 3, Future Cop: LAPD puts players in the role of a robot, the X-1-Alpha, and sets them off on to fight in a “Crime War” taking place in Los Angeles in 2098. Aside from its science fiction setting and strange backstory, the game borrows a lot from traditional mech games like MechWarrior in how it approaches gameplay style. Not only does your mech have a combat mode but also a fast-travelling vehicular mode that you can switch to when needed. There are two main gameplay modes: Crime War and Precinct Assault, both of which can be played in either cooperative or single-player modes. Interestingly, Precinct Assault uses a gameplay type that would be most familiar to players of massively online battle arena games, also known as MOBAs. Debuting in 1998, Future Cop: LAPD nonetheless shows its forward-thinking design inspirations in this area. Modern players that love co-op gaming should specifically give Precinct Assault a look as it is perhaps the most ostensibly modern part of the now twenty year old game. Crime War is more or less the narrative-based portion of Future Cop: LAPD and it works well for what it is. The game begins in LA’s Griffith Park and proceeds through other areas of the city as you complete objectives. Basically you tackle missions ranging from domestic terrorism prevention to more heavily sci-fi fare. It’s a pretty cool mix of believable and extraordinary that makes the game a fun romp. Interestingly, cooperative play is encouraged in the game and sports a unique twist. Unlike most traditional cooperative games, in Future Cop: LAPD the life bar of your player is intertwined with that of your partner, leading to some pretty interesting situations where cooperation is basically forced upon you in order to survive. No one can die because that leads to the end of the game for both players. Precinct Assault is basically a death match-style mode that gives the player a primary base to start with and allows them to activate turrets along the way. Again, as this gameplay is often common in MOBAs, Future Cop: LAPD’s use of it is striking. The match ends when the other player’s base is destroyed by a specific weapon type. Though it received a lukewarm sales reception upon its release, Future Cop: LAPD nonetheless wowed some critics some of which were especially fond of the game’s Precinct Assault mode. Modern gamers will find themselves right at home with Future Cop: LAPD’s basic layout and should enjoy the cooperative gameplay offered in either the story mode or the Precinct Assault gameplay. Fans of mech titles really should give Future Cop: LAPD a look but those of us who enjoy a good battle arena-type game should also perhaps consider it.